Today I want to write to you about a special day that is celebrated in the United States and in some other countries around the world. Valentine’s Day is celebrated on February 14 and is a day that is focused on love. Much of the time, the focus is on romantic love, but for my family, we celebrate friendship and family love. The love that is from God, and that we are to share with each other and other people. 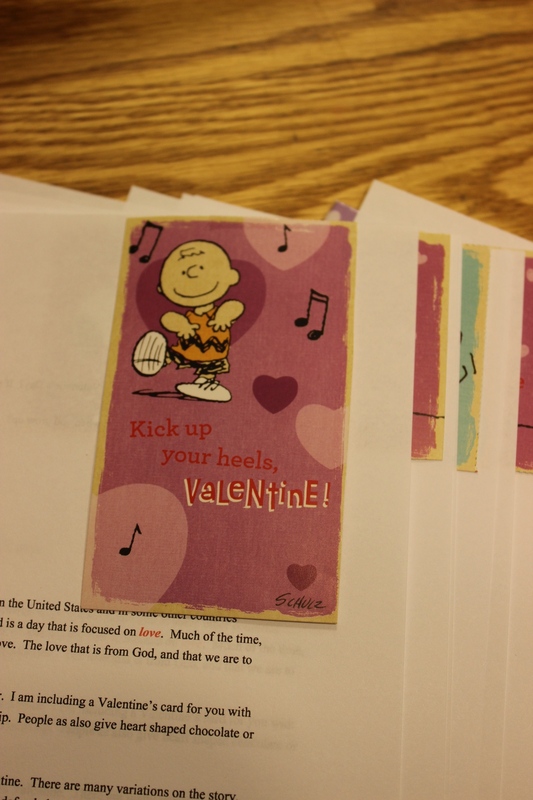 We make or purchase valentine cards to give to friends and each other. I am including a Valentine’s card for you with this letter! The cards are often funny and celebrate the gift of friendship. People also give heart shaped chocolate or other candy to their loved ones. The story of Valentine’s Day comes from the life of a man named Valentine. There are many variations on the story, but what I have read and believe is that Valentine was a Godly man who defended marriage during a time when a ruler was actually forbidding marriage. I enjoy making February 14 a special day with my children and my husband. 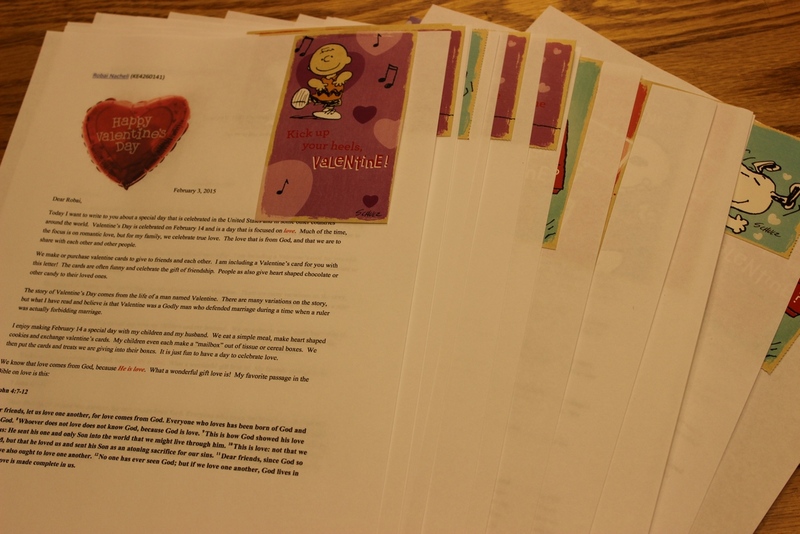 We eat a simple meal, make heart shaped cookies and exchange valentine’s cards. My children each make a “mailbox” out of tissue or cereal boxes. We then put the cards and treats we are giving into their boxes. It is just fun to have a day to celebrate love. Does your country celebrate Valentine’s Day? If so, how? What Bible verse do you love? What would you love to do when you grow up? This letter is one of the most replied to letters I have sent over the years. Almost all of the kids responded telling me who he or she loves. I would love to hear about your correspondence this month. Are you preparing Valentine’s greetings or other special messages?